Born in 1961 I grew up in Delkenheim (between Wiesbaden and Frankfurt). After my Abitur at Gutenberg-Schule (Wiesbaden) I studied mathematics and physics at the University of Mainz and at the University of Heidelberg (1980-1986). Then I switched to computer science and did my PhD in 1992 at Karlsruhe University (Prof. Dr. Peter Schmitt). 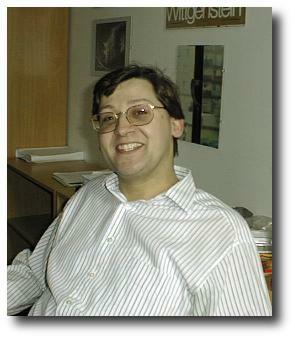 During 1999 (being on leave from Koblenz), I was Visiting Professor at the University of Maryland). From 2001-2004 I was Reader for the foundations of logic and knowledge representation in the Computer Science Department of The University of Manchester (Associate Professor). After working in several areas of Computational Logic (nonmonotonic reasoning, logic programming, deductive databases, knowledge representation), I am also involved in Multi-Agent Reasoning since 1998. I published more than 150 technical papers: among them more than 50 papers in refereed journals and books and more than 40 papers at refereed conferences. I have coauthored two monographs (Nonmonotonic Reasoning (Cambridge University Press), Heterogenous Active Agents (MIT Press)) and 4 invited chapters in books. In addition, I edited 8 books (Springer LNCS series) and 5 special issues of the Annals of Mathematics and AI. I have organised various international workshops and conferences and several Dagstuhl seminars. I have been invited for more than 50 talks/tutorials and have given regular classroom lectures for longer terms in Germany, USA, Austria, Argentina, Australia and the UK. I am on the Editorial Board of AI Communications: The European Journal of Artificial Intelligence, of Annals of Mathematics and Artificial Intelligence (AMAI) as well as of Journal of applied Logic. I was Member and Coordinating Node of Agentlink II for The University of Manchester. Here is my small CV together with selected publications from the past 4 years. European RTD project SEmantic Webs and AgentS in Integrated Economies (SeWAsIE), issued from 2002-2005. European Working Group on Answer Set Semantics (WASP), issued from 2002-2005. UK project on Optimisations of Heterogenous Agent Systems issued from 2002-2005. Funded by EPSRC. Multi Agents and Defeasible Reasoning: DeReLoP. Disjunctive Logic Programming issued from 1995-2000.